If you have $3,000 lying around, like Blizzard's games, and want to donate money to a good cause, then I've got something you should see - but do come quickly, please. Blizzard doesn't release many games, but when it does it always goes whole hog on the collectors' editions. Unfortunately, this makes said collectors' editions nigh-impossible to obtain within mere weeks after their announcement. If you want to get your hands on four collectors' editions for every game Blizzard has released since 2007 (that's WoW: Burning Crusade, WoW: Wrath of the Lich King, WoW: Cataclsym and StarCraft II) then you might want to head over to Bidding For Good, where a charity auction contains just that - as well as a ton of other stuff. Each collectors' edition has been signed by the development team behind the game (or expansion pack), making them quite rare indeed. 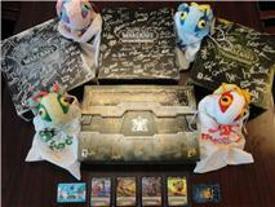 The winner of this auction will also get a year's subscription to WoW, four of the ultra-rare in-game loot cards from the WoW TCG (X-51 Nether Rocket, Savage Raptor, Blazing Hippogryph and El Pollo Grande), the "Baby Murloc" WoW in-game pet from the original 2005 BlizzCon, and all four of the plush baby Murloc toys. Phew. The combined worth of all of these goods - as estimated by eBay prices, one assumes - is just shy of $4,000. But with just 12 hours left on the bidding clock, the price here remains at the starting point of $3,000. Really, when you think about it, that's actually a pretty good deal. All proceeds from the auction will go to Peninsula Education Foundation, so if you've got three grand burning a hole in your pocket, why not put it towards a good cause?